Are you tired of wandering aimlessly through every department store and specialty shop in town, braving the frigid winter temperatures and battling your way through crowds of frantic shoppers? Does spending hours at your desk staring at a computer screen while you browse through products offered by thousands of merchants sound like an experience you would rather not endure? Are you looking for creative Christmas ideas for those last few recipients on your holiday shopping list? Take a deep breath; you have found your solution right here at Christmasgifts.com. No matter how creative a shopper you are, it seems like the same thing happens year after year. You complete most of your holiday shopping with all of the enthusiasm and expertise of a superhero, and just when you think you are almost done and your Christmas budget is starting to dwindle, you lose your momentum. You have got just a few more individuals to buy for, only a few more creative gifts to find, and your mind just goes blank. If this sounds like you this holiday season, never fear! Santa’s SuperElf is here to save the day! Before we get started with our list of some of the best Christmas gift ideas ever, however, first things first. We need to decide who is left to buy for. one of a kind gift the whole family will love. Do you have a coworker, boss or even just your average coffee love on your list of recipients this year? 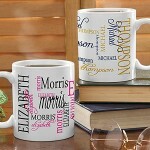 These Signature Style Personalized Coffee Mugs are wonderful Christmas gift ideas! Choose from an 11 oz. or a 15 oz. mug and personalize it with the first name, full name or family title of the recipient for a unique gift that is certain to be a hit. You can even choose two of your favorite colors for the lettering to make this gift truly one of a kind. 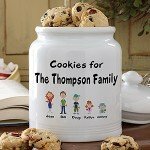 Fill your Signature Style Personalized Coffee Mug with festive holiday candy, cookies, colorful pens and pencils, or even a small stuffed toy or plant and create an even more unique gift. Is there a new addition to the family or are you looking for gifts for a group? 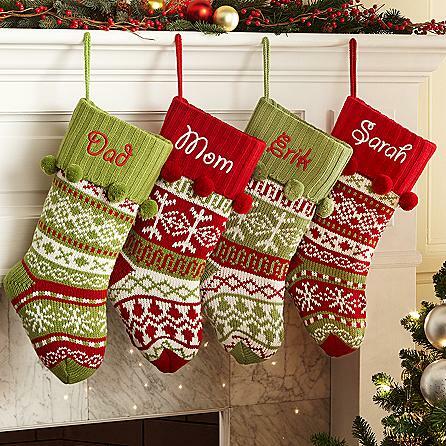 Check out these Knit Argyle/Snowflake Personalized Stockings and give them a gift that is certain to knock their socks off this Christmas. Choose from argyle or snowflake pattern in two color variations and don’t forget to personalize them with your recipient’s name or nickname. Measuring 18 inches long and 8 ½ inches wide at the cuff, these old fashioned sweater stockings are the perfect size for filling with candy, holiday treats and creative stocking stuffers. Are you almost finished with your holiday shopping this year? 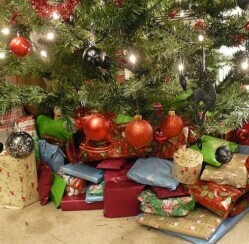 What are your favorite Christmas gift ideas from Christmasgifts.com?